The leaders of Russia and the United States have held a bilateral meeting on the sidelines of the UN General Assembly in New York, shortly after they both addressed the international community on the world’s most pressing geopolitical issues. The meeting between the two leaders lasted for approximately an hour and a half – surpassing the limit of 55 minutes. After the talks, President Putin walked out to meet the press and answer questions about the meeting and the speech he had delivered to UNGA. While the participation of the Russian military in a ground operation in Syria is absolutely out of question, Putin said that Moscow is considering other options in supporting those fighting terrorists on the ground in Syria, such as the Kurdish militia and, first of all, the Syrian national army. The joint information center that was created in Baghdad to coordinate the anti-terrorist efforts of regional powers is one example of such support, Putin noted, adding that this HQ is open for anyone who is interested in the fight against terrorism to join. Commenting on some Western leaders’ adamant position that Assad is a figure to ‘deal with’ and who must go, Putin once again noted that it is only up to the Syrian people to decide and chose their leader. “I have great respect for my colleagues – the US President, as well as the French – but they are, as far as I know, are not citizens of the Syrian Republic, and therefore [it is] unlikely [that they] should be involved in determining the fate of another state’s management,” Putin told the media. However he emphasized that anti-terrorist fighting in Syria must be conducted in accordance with political processes. Before going behind closed doors the two presidents shook hands in front of the cameras, but refused to answer any questions. Earlier in the day, UN Secretary-General Ban Ki-moon hosted a state luncheon for the heads of delegations to the 70th Session of the UN General Assembly, with Russian President Vladimir Putin and US President Barack Obama sitting either side of him. READ MORE: Putin to UN: Export of so-called democratic revolutions continues globally The informal lunch followed the high-profile addresses by the two leaders at the opening of the UNGA debate on Monday. 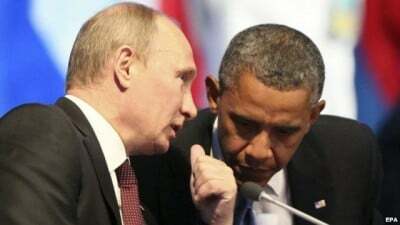 READ MORE: Obama to UN: US ready to work with Russia and Iran on Syria The personal relationship between Putin and Obama has cooled off since Washington introduced sanctions against Moscow last year, accusing it of escalating the crisis in Ukraine. One of the last times that the Russian and American leaders met was during the Belfast G8 Summit in June 2013. In September the same year, Obama and Putin also briefly met on the sidelines of the G20 summit in St. Petersburg, Russia. Since then, most of their exchanges have taken place over the phone, during which both leaders focused on solving the Ukrainian and Syrian crises.